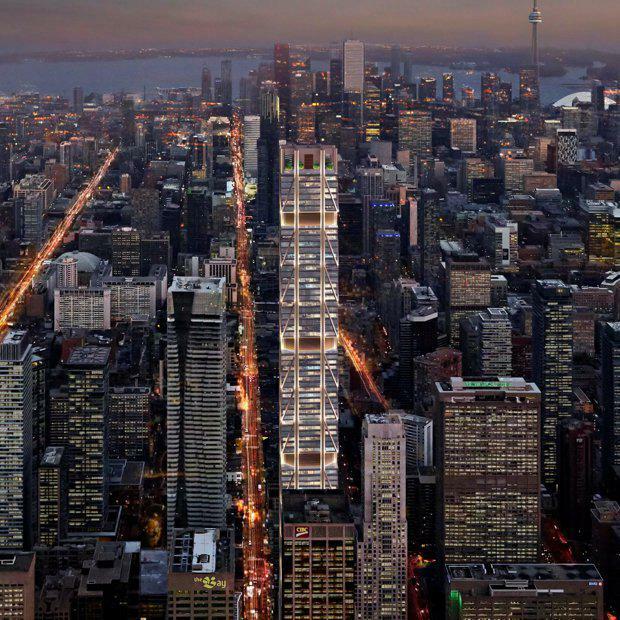 Canada's tallest building, The One, has officially broken ground in Toronto. The 85-storey, 306 metre structure is designed by British architecture firm, Foster & Partners and developed by Sam Mizrahi. Mizrahi controversially demolished the 114-year old Stollerys building located at the Yonge and Bloor Street site in 2015. The tower will bring a "vertical retail" experience to downtown Toronto, with The One's base comprises nine-storeys of shops, cafes and restaurants, arranged around a soaring 60-metre atrium. Apartments which will be accessible via a glass bridge at level 12. The apartments will incorporate winter-gardens with panoramic city views and challenge what people come to expect in tower design. In contrast to the typical glass residential tower with shallow balconies, the façade is characterised by warm metallic tones and a distinctive bronze exoskeleton frame, which transforms as the tower rises to articulate the change in function. 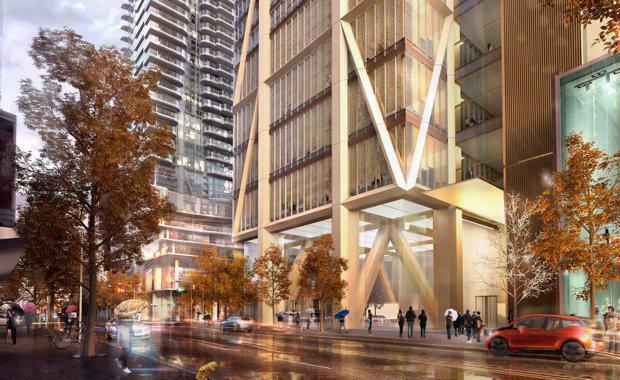 Foster & Partners senior partner Giles Robinson said the project was the final piece of the jigsaw in the tower cluster at the Yonge and Bloor node – one of the most prominent intersections in the city. "The project creates a new anchor for high-end retail along Bloor Street West, while respecting the urban scale of Yonge Street. The design is respectful of the legacy of the William Luke Buildings, and incorporates the historic 19th century brick structures within the larger development," he said. The residential floors are based on consistent 57 square metre planning modules, allowing for flexible configurations throughout. 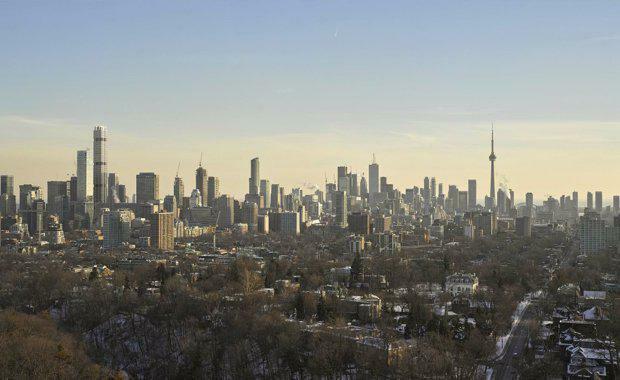 The tower is topped by a series of duplex penthouses, which have sweeping views across Lake Ontario and beyond. Access and amenities to the residences is via a sky lobby with spa and fitness facilities, library and formal entertaining rooms, and a large south- facing terrace providing the residents and their families with luxurious, intimate spaces for rest and relaxation. The One is integrated with Toronto's PATH network -- an underground walkway linking 30 kilometres of shopping, services and entertainment. The system facilitates pedestrian linkages to public transport, accommodates more than 200,000 business-day commuters, and thousands of additional tourists and residents on route to sports and cultural events. “The One will set new standards for commercial and retail developments in Canada. We’re extremely excited to be working with Mizrahi to realise this fantastic vision, and look forward to the next stages of the project with great anticipation,” Robinson said. Images courtesy Foster + Partners.